A Terrazza glass patio roof will keep you sheltered from the elements all-year-round and allows your patio furniture to remain outside without being damaged. With numerous versions available the elegant construction, attractive design and high durability make this a perfect addition to any building. The Terrazza patio roof adds a luxury feel to any building with its elegant construction, modern design and durability. LED light bars extend the use of your patio roof well into the evening. Light bars can be wall mounted or ﬁtted to the roof supports, depending on your preference. Terrazza patio roofs have exceptional stability and durability. Each roof construction is based on static calculations run by a certiﬁed engineering company. The Terrazza Original has integrated guttering and no overhang. The Terrazza Extra has an overhang and pre-ﬁtted guttering. 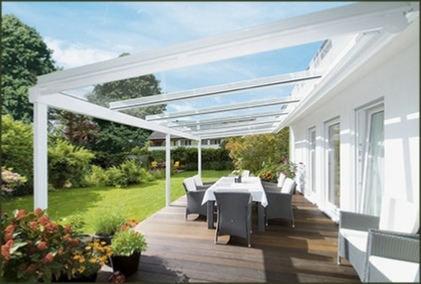 The Terrazza Plus has an overhang and integrated guttering. 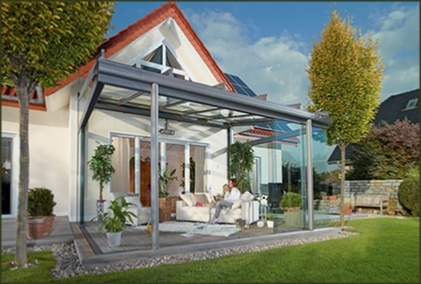 With fixed glazing below the Terrazza side roof support, fully transparent front elements can be installed, with only a single vertical or horizontal strut required. Lightweight fixed glazing at the top of the trapezium, with an easy-glide sliding wall or a multi-function folding partition underneath, is a very popular combination. Sturdy fixed glazing at the top of the trapezium, with a multi-function sliding wall below, or even framed fixed glazing to hold off strong side winds.